You don't have to go into the forest to appreciate these Danner Men's 45011 Pronghorn Brown Mossy Oak Infinity 8 Inch Waterproof Insulated Boots. The brown uppers of this footwear is manufactured with waterproof, full-grain CamoHide leather and Mossy Oak break- ... (see full details) (see specifications) #DNN45011. You don't have to go into the forest to appreciate these Danner Men's 45011 Pronghorn Brown Mossy Oak Infinity 8 Inch Waterproof Insulated Boots. The brown uppers of this footwear is manufactured with waterproof, full-grain CamoHide leather and Mossy Oak break-up Infinity camouflage material. You'll blend in everywhere woodsy you go as a result. At least your feet will. (We've heard stories about your social skills.) The 8-inch design of these premium shoes looks just as good out in the woods as it does when you're punching the clock on Monday morning. The all-leather toe and heel caps protect against signs of scuffs and wear. The 100 denier nylon adds abrasion-resistant strength, not to mention the Mossy Oak camo pattern. Even the hardware on these Pronghorn boots is durable. Full-grain leather is good stuff. It resists weather and wear, and still stays flexible. But it doesn't stand alone in this design. You'll also have 100% breathable Gore-Tex to keep you dry when you wear these insulated boots. The Gore-Tex lining allows natural airflow to get to your feet even as it prevents moisture from getting to your skin. Constructed with a streamlined and lightweight profile, these brown/mossy camo boots are also soft on the interiors. The Ortholite footbeds cradle and conform to your steps to keep you going all day long. They’re crafted with triple-layer cushioning to keep the design super-soft. The soft insoles aren’t alone in there. Your feet will be surrounded by 400 gram weight Thinsulate insulation. This insulation of these men's shoes is famous for its light weight and thin design. In 400 gram weight, this material won’t give you too much heat. It’s just enough to keep you warm out there while you’re working and moving around. And while you’re moving around, you’ll be on top of the Danner Terra Force platforms. These include different features that create stable, supportive platforms for you to stand on. External nylon shanks, which keep your arches lifted to reduce foot fatigue, are just one part of the design of these exceptional boots. You’ll also get the support of full-length midsole plates and the softness of impact-absorbent polyurethane midsoles. 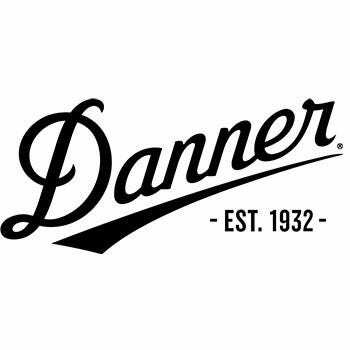 The Danner Pronghorn outsoles, manufactured from bouncy rubber compounds, are designed to give you traction over rugged terrain to keep steps steady wherever you go. The outsoles are stitched to the uppers, right through the insole plates, to give your steps extra stability across a wide platform. Rugged hardware gives you a secure fit and long-lasting performance. These Danner Men's 45011 Pronghorn Brown Mossy Oak Infinity 8 Inch Waterproof Insulated Slip-Resistant Boots are designed for the woods, but you can appreciate them no matter where you walk. So go ahead and add a pair to your cart today. Good boots! Warm, but not too warm. Comfortable right out of the box and keep my feet dry. I would buy another pair. I really, really like these danner boots for hunting, work and other things. These boots rock. Danner Boots: Men's 45011 Waterproof Insulation Camo Mossy Oak Work Boots is being added to your cart.